SERVICE MBRM will license the ordered software to you, the client. If requested, consultancy services, including installation, training and customisation, will be provided. CHARGES The client agrees to pay the license fees of the software as well as any requested consultancy. Accounts are due as indicated on the invoice under "Terms of Invoice". Interest will be charged at 0.4% per week on amounts overdue and debited weekly. Without prejudice to any of MBRM's other rights or remedies, failure to pay an outstanding invoice after 3 month of issue will automatically invalidate the license, but the account charge (with interest) would still be payable. COPYRIGHT MBRM grants the right to use this software by means of a license. It does not sell any rights in, or title to, the software. 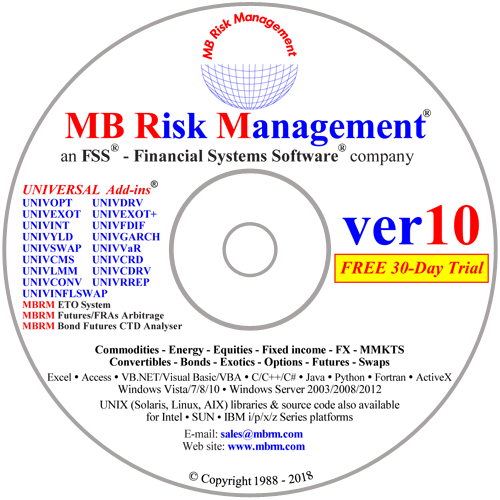 All the software is owned by MBRM and is protected by copyright laws. Use on more machines than licensed will be a breach of both copyright law and of the license contract. Use on a machine is defined as being able to access any of our software's functionality from that machine (including access by way of network, internet, distributed processing and/or terminal replication technology). The software must not be used for any service bureau work (where calculations are performed on behalf of a third party), server service (such as a .NET server), or time-sharing arrangement without a specific license from MBRM which covers such use. Licenses are not transferable without prior permission of MBRM. Reverse engineering, including attempts to bypass the license security, of the software is prohibited. The client confirms that it is not participating in the development or marketing of software competing with the Universal Add-ins. SALE BASIS Unless otherwise agreed in writing at the time of ordering, products are licensed on an outright sale basis and not on a purchase or return basis. SUPPORT / MAINTENANCE Support / Maintenance Contract is an integral part of our software package and is renewed annually. It can be cancelled by giving 30 days advance notice prior to the expiry date of the current support contract -- otherwise it is automatically renewed. If the Support / Maintenance is cancelled, the license to use the associated Add-ins is simultaneously cancelled. WARRANTY MBRM warrants that the software will perform substantially in accordance with its manual for a period of three months from the date of sale. Any implied warranties are limited to three months from the date of sale, or, if later, to the minimum allowed under law. All other warranties, either express or implied, are disclaimed. TESTING Since the software is complex, the client agrees that it will test the software to ensure that the software performs error-free before relying on any functionality or calculated results. REMEDY The exclusive remedy of a client for any breach of MBRM's Limited Warranty or any other term or condition, shall be, at MBRM's discretion, either the repair of the software or return of the amount accruing under contract for that incident. Any remedy provided shall be similarly governed by these terms. LIABILITY The maximum liability of MBRM for any incident, howsoever caused, shall be limited to the amount accruing under contract for that incident. Under no event shall MBRM's total cumulative liability to a client for all incidents exceed the net amount actually paid, directly or indirectly, to MBRM by the client (i.e. after deducting any amount repaid by MBRM to the client). In no event shall MBRM be liable for any loss of profit or any other commercial damage, including but not limited to special, incidental, consequential or other damages, even if MBRM had been specifically informed of the possibility of such damages. MBRM EMPLOYEE PROTECTION The client is prevented from employing (directly or indirectly), or utilising the services of, any employee of MBRM, who was employed by MBRM during the period which the client was using any MBRM software, except with the written agreement of an MBRM director. LAW All contracts are construed and governed by English law and shall be subject to the exclusive jurisdiction of the English Courts. If any portion of these terms is construed to be invalid or unenforceable, the remainder shall not be affected and remain fully enforceable. These terms may only be amended in a written contract between you and an authorised director of MBRM. All other rights are reserved by MBRM.